The aim of this research is to prove the validity and reliability of extreme sports participation scale. Accordingly, validity and reliability study of the scale were carried out adding the dimensions of motive for participating in extreme sports obtained from the focus group study performed within scope of the examination of related literature and the research to the scope of the scale. The scale was applied on the individuals who utilize the extreme sports facilities in some provinces in Turkey and were chosen with convenience sampling method. The content validity of the scale (expert opinion), convergent validity (the lowest factor load value is 0.515, the highest is 0.892), differentiation/external validity (positive relationship on medium and high level in all factors) and structure validity (5-factor and 35-item) were tested. The internal consistency coefficient Cronbach’s Alpha (0.957) analysis was used for the reliability of the scale. As a result of the analyses, it was included that a valid and reliable measuring tool was obtained; therefore the research achieved its aim. Adamson, B. J., & Wade, J. K. (1986). Predictors of sport and exercise participation among health science students. Australian Journal of Science and Medicine in Sport, 18(4), 3-10. Addeo, R. R., Greene, A. F., & Geisser, M. E. (1994). Construct validity of the Robson self-esteem questionnaire in a college sample. Educational and Psychological Measurement, 54(2), 439-446. Buyukozturk, S. (2009). Data Analysis Handbook for Social Sciences Handbook. s. 121-125. Pegem Academy, Ankara. Caspersen, C. J., Powell, K. E., & Christenson, G. M. (1985). Physical activity, exercise, and physical fitness: definitions and distinctions for health-related research. Public health reports, 100(2), 126. Child, D. (1990). The essentials of factor analysis. Cassell Educational. Comrey, A. L., & Lee, H. B. (2013). A first course in factor analysis. Psychology Press..
DiLorenzo, T. M., Stucky-Ropp, R. C., Vander Wal, J. S., & Gotham, H. J. (1998). Determinants of exercise among children. II. A longitudinal analysis. Preventive Medicine, 27(3), 470-477. Duda, J. L., Chi, L., Newton, M. L., & Walling, M. D. (1995). Task and ego orientation and intrinsic motivation in sport. International journal of sport psychology. Donnelly, P., & Young, K. (1988). The construction and confirmation of identity in sport subcultures. Sociology of Sport Journal, 5(3), 223-240. Ercan, I., & Kan, I. (2004). Reliability and Validity in Scales. Uludag University Journal of the Faculty of Medicine, 30(3), 211-216. Gill, D.L., & Gross, J.B., Huddleston, S. (1985). Participation motivation in youth sports. International Journal of Sport Psychology, (14), 1–14. Gould, D. (1982). Sport psychology in the 1980s: Status, direction, and challenge in youth sports research. Journal of Sport Psychology. Gould, D., Feltz, D., & Weiss, M. (1985). Motives for participating in competitive youth swimming. International Journal of Sport Psychology. Canada. Parliament. House of Commons. Standing Committee on Canadian Heritage, & Mills, D. J. (1998). Sport in Canada: Everybody's business: Leadership, partnership and accountability. The Sub- Committee. Hymbaugh, K., & Garrett, J. (1974). Sensation seeking among skydivers. Perceptual And Motor Skills, 38(1), 118-118. Jones, G. W., Mackay, K. S., & Peters, D. M. (2006). Participation motivation in martial artists in the west midlands region of England. Journal of sports science & medicine, 5(CSSI), 28-34. Kahle L., R. Shoham, A., Gregory M., R. (2004). Sports Marketing and the Psychology of Marketing Communication. Lawrence Erlbaum Assocıates, Publıshers Mahwah, New Jersey London. Kendzierski, D., & DeCarlo, K. J. (1991). Physical Activity Enjoyment Scale: Two validation studies. Journal of Sport & Exercise Psychology. Koivula, N. (1999). Sport participation: Differences in motivation and actual participation due to gender typing. Journal of Sport Behaviour, 22, 360-380. Kremer, J., Trew, K. J., & Ogle, S. (Eds.). (1997). Young people's involvement in sport. Psychology Press. Kropp, F., Lavack, A. M., & Holden, S. J. (1999). Smokers and beer drinkers: values and consumer susceptibility to interpersonal influence. Journal of Consumer Marketing, 16(6), 536-557. Kulaksizloglu, A., Dilmac, B., Eksi, H., & Otrar, M. (2003). The linguistic equivalence scale, reliability and validity study of universities form- Compliance Scale. Educational Sciences and Applications, 2(3), 49-63. McDonald, M. A., Milne, G. R., & Hong, J. (2002). Motivational factors for evaluating sport spectator and participant markets. Sport Marketing Quarterly, 11(2), 100-113. Milne, G. R., & McDonald, M. A. (1999). Sport marketing: Managing the exchange process. Jones & Bartlett Learning. Mobley, M. (1985). On the razor’s edge: the management of risk. Trends, 22(3), 12-14. Park, H. (2004). Analyzing motivational factors of action sports participants (Doctoral dissertation. Washington State University. Nunnally, J. C., Bernstein, I. H., & Berge, J. M. T. (1967). Psychometric theory (Vol. 226). New York: McGraw-Hill. Nunnally, J. & Bernstein, I. (1994). Psycometric Theory. pp..33-34, McGraw-Hill. Ko, Y. J., HyeWon, P., & Claussen, C. L. (2008). Action sports participation: consumer motivation. International Journal of Sports Marketing and Sponsorship, 9(2), 111-124. Pollock, M. L., Gaesser, G. A., Butcher, J. D., Després, J. P., Dishman, R. K., Franklin, B. A., & Garber, C. E. (1998). ACSM position stand: the recommended quantity and quality of exercise for developing and maintaining cardiorespiratory and muscular fitness, and flexibility in healthy adults. Med Sci Sports Exerc, 30(6), 975-991. Preacher, K. J., & MacCallum, R. C. (2002). Exploratory factor analysis in behavior genetics research: Factor recovery with small sample sizes. Behavior genetics, 32(2), 153-161. Rinehart, R. E. & Sydnor, S. (eds) (2003). To the extreme: Alternative Sports. Inside and Out. 1-5, Albany, NY: State University of New York Pres. Robinson, D. (1985). Stress seeking: Selected behavioral characteristics of elite rock climbers. Journal of Sport Psychology, 7, 400–404. Robinson, D.W. (1992). A descriptive model of enduring risk recreation involvement. Journal of Leisure Research, 24(1), 52-63. Robson, P. (1989). Development of A New Self-report Questionnaire to Measure Self Esteem. Psychological Medicine, 19(02), 513-518. Rowland, G. L., Franken, R. E., & Harrison, K. (1986). Sensation seeking and participation in sporting activities. Journal of Sport Psychology, 8(3), 212-220. Ryckman, R. M., & Hamel, J. (1993). Perceived physical ability differences in the sport participation motives of young athletes. International Journal of Sport Psychology. Schneider, T. M. (2001). Sensation seeking in ultra-endurance sports. Unpublished manuscript. San Jose State University. Risk Among Adventure Racers. Self, D. R., De Vries Henry, E., Findley, C. S., & Reilly, E. (2007). Thrill seeking: The type T personality and extreme sports. International journal of sport management and marketing, 2(1), 175-190. Dunning, E. (1972). The Cross-Cultural Analysis of Sport and Games. Sportwissenschaft, 2(3), 333-335. Shoham, A., Rose, G. M., & Kahle, L. R. (1998). Marketing of risky sports: From intention to action. Journal of the Academy of Marketing Science, 26(4), 307-321. Sonstroem, R. J. (1984). Exercise and self-esteem. Exercise and Sport Sciences Reviews, 12(1), 123-156. Steptoe, A., Kimbell, J., & Basford, P. (1998). Exercise and the experience and appraisal of daily stressors: a naturalistic study. Journal of Behavioral Medicine, 21(4), 363-374. Tavsancil, E. (2006). Data Analysis and Measurement of Attitudes and SPSS. pp.177-181, Ankara:Nobel Publish. Tholkes, B. F. (1998). Defining Risk. Camping Magazine, 71(5), 24-26. Wann, D. L. (1995). Preliminary validation of the sport fan motivation scale. Journal of Sport & Social Issues, 19(4), 377-396. Wankel, L. M. (1993). The importance of enjoyment to adherence and psychological benefits from physical activity. International Journal of Sport Psychology. Watkins, L., & Gnoth, J. (2005). Methodological issues in using Kahle's list of values scale for Japanese tourism behaviour. Journal of Vacation Marketing, 11(3), 225-233. Weiss, M. R. (1987). Self-esteem and achievement in children's sport and physical activity. Advances In Pediatric Sport Sciences, 2, 87-119. Zaggelidis, G., Martinidis, K., & Zaggelidis, S. (2004). Comparative study of factors-motives in beginning practicing judo and karate. Physical Training: Fitness for Combatives, 1-8. Zuckerman, M. (1979a). Sensation seeking and risk taking. In Emotions in personality and psychopathology (pp. 161-197). Springer US. Zuckerman, M. (1984b). Experience and desire: A new format for sensation seeking scales. Journal of Behavioral Assessment, 6(2), 101-114. Zuckerman, M. (2000c). Are You A Risk-Taker?. Psychology Today-New York-, 33(6), 52-57. ISNAD Şimşek, Kerem . "EXAMINATION OF THE VALIDITY AND RELIABILITY OF EXTREME SPORTS PARTICIPATION SCALE: PILOT STUDY". 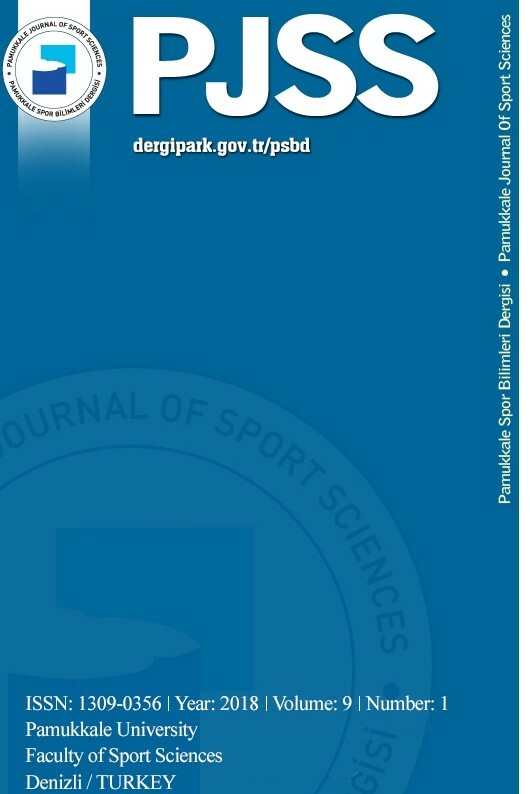 Pamukkale Journal of Sport Sciences 7 / 1 (January 2016): 48-66.